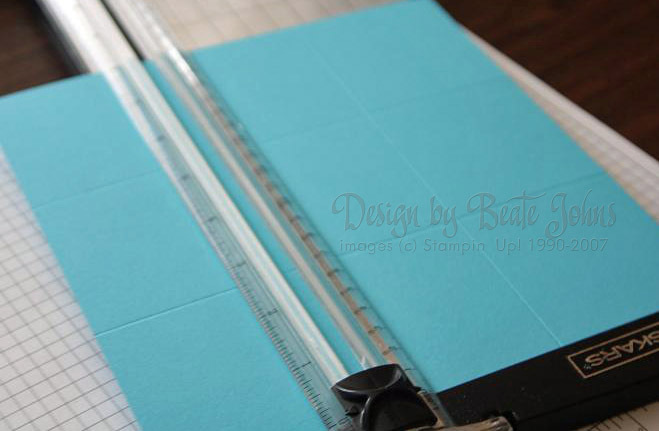 Score your cardstock into nine equal squares. For my 8 1/4″ square I scored at 2 3/4″ and 5 1/2″ both horizontally and vertically. For 6″ square score at 2″ and 4″. 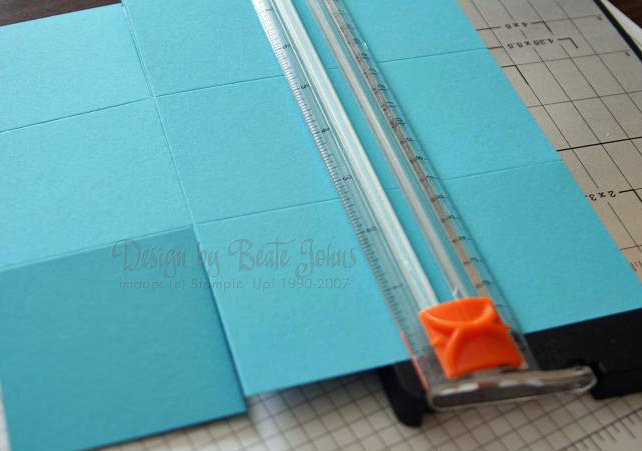 For 9″ square score at 3″ and 6″ and for 12″ square score at 4″ and 8″. Cut the two scored lines to the first horizontal score on two opposing sides. 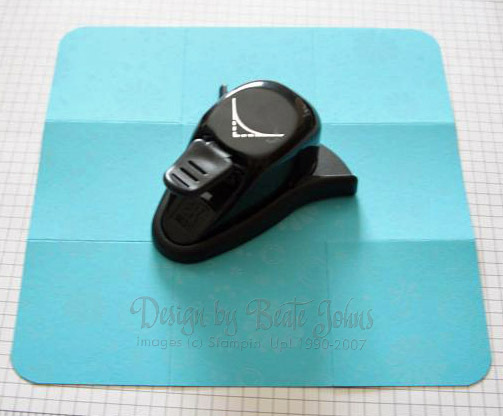 Decorate your cardstock. 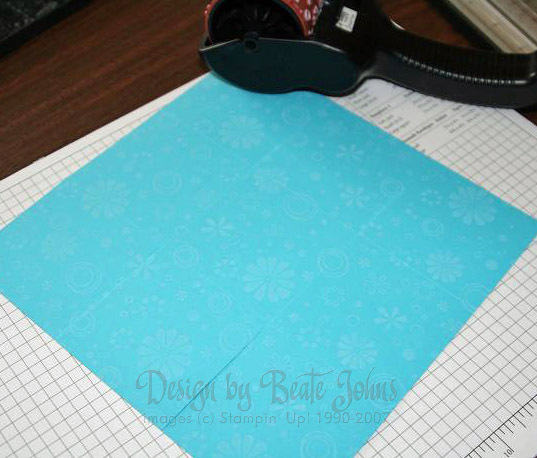 I used the Petals Jumbo wheel from the Stampin’ Up! 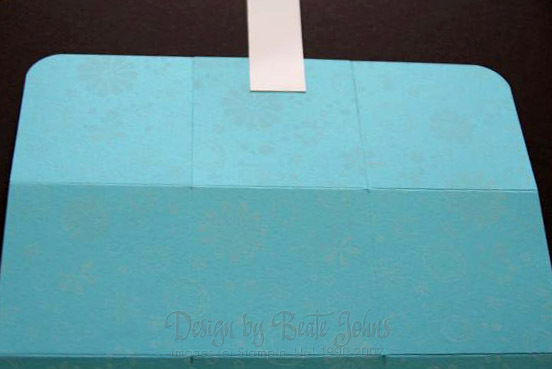 Spring mini catalog and wheeled in white on the turquoise cardstock. Add some sticky strip on both ends of your basket handle. Tape one end of your basket handle to one center square of the basket that has the two cuts one each side. Tape the handle on the outside section of the basket. It will be covered later by the two sides next to it. 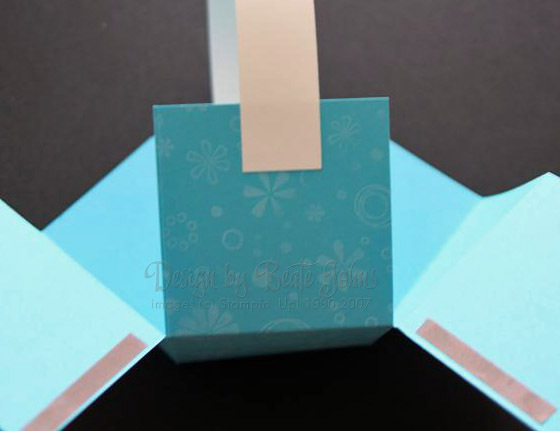 Turn your cardstock over so you see the basket inside (unstamped side). 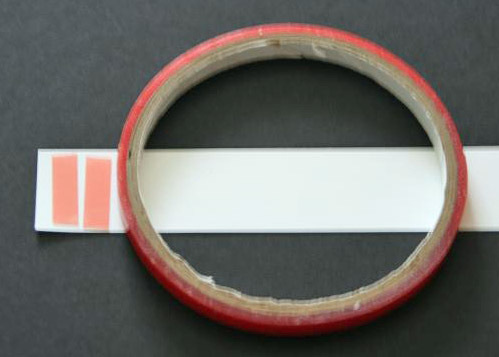 Add strips of sticky tape as shown. Don’t have the sticky tape go all the way to the scored line. That might show when you fold the sides in to make the basket shape. 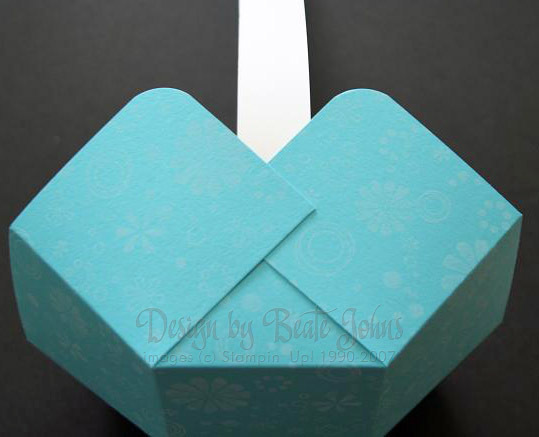 Fold both sides over your center square and tape them down over your basket handle. Tape the second end of your basket handle on the opposite square on the basket. 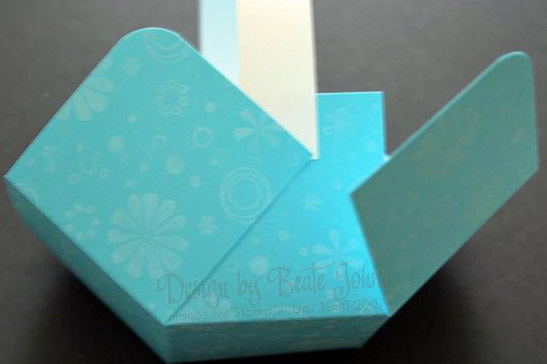 Again fold both the left and the right square over the middle square, covering the basket handle. What a cute basket – thanks for your tutorial. 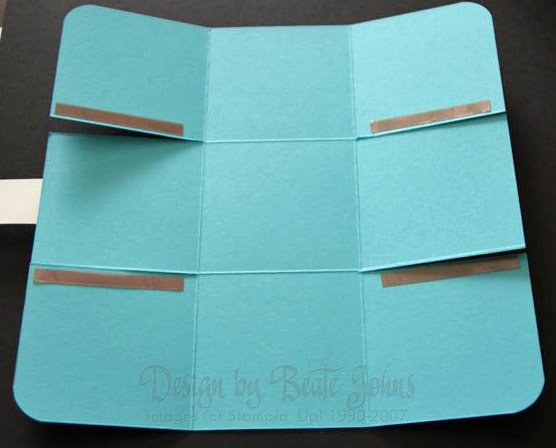 I just found your blog recently but have loved your tutorials on SCS, most recently the Triangle Trifold. Being quite new to card making, your tutorials have been a big help to me. Thanks so much. You have been very busy since returning!! Great tutorial! I’ll have to add a link to it from my basket since I’ve had a few requests for more detailed instructions!! Fantastic tutorial and as usual so clearly demonstrated, TFS. 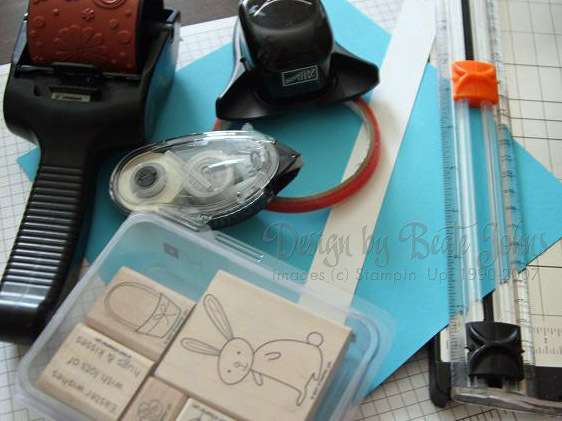 sweet tutorial, Beate! I was needing one on a basket, thanks! 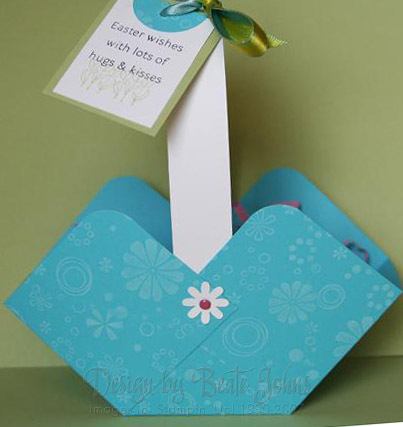 Great Tutorial & just in time for Easter. You sure are a busy bee!! Thanks so much for writting it up so we all can enjoy it. Thank you so much for the easy tutorial. It was very clear and easy to understand. I just discovered tutorials and am loving them, especially yours. I just made three baskets to put out on my two year old daughter’s little table for her and friends as favor baskets when we have guests for July 4th. I know they’ll be a big hit and that my friends will be amazed at how crafty I am! 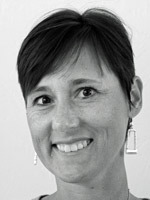 I’ll definitely pass along your blog so they can get creative too!